Princess Louisa Inlet is probably one of the most beautiful places I've ever been or seen. It is quite astonishing. The route through Jervis Inlet is pretty awe inspiring as well. Everywhere are huge mountains and once you get into Princess Louisa Inlet, there are waterfalls everywhere - and then you get to the end where Chatterbox Falls drops into the ocean - it's just incredible. I've lived on the Sunshine Coast off and on for well over 25 years and only just made the trip up the Inlet. Now that I've been I can't believe I never went sooner. My daughter and I made the trip up with the Westcoast Wilderness Lodge on their Zodiac boat. This is an open boat that seats probably about 20 people, but there were only three of us plus the skipper on this trip. Total distance to Chatterbox Falls is around 65 kms (40 miles). Westcoast Wilderness Lodge perched up on the hill, overlooking the Inlet. First thing we had to do was put on a bright orange floater suit. If you're like us, you might not be too keen on the prospect, but in the end you will be glad to have it. As I said above, you are in an open boat going about 30 mph. Even on a warm day this can feel cool so the suit not only acts as your life jacket, but keeps you warm on the way up and back. Once you get there, you can peel it off and go explore. Skipper Don got us all settled and we headed off. Along the way, he stopped at places of interest and provided tidbits of historical facts. Just enough so I wasn't bored. We stopped to see Soda Falls, two sets of petroglyphs, Vancouver Bay and at the entrance to Princess Louisa Inlet. When Captain Vancouver was surveying the area, he missed this Inlet because he thought it was a fresh water river emptying out into the ocean. This is because it is quite a narrow entrance and the water rushes through on the changing tides, a little like the Skookumchuck, but not quite so dramatic. Way out here in the middle of nowhere is the Malibu Club, one of Young Life's original properties. Built back in the 1940's by an American entrepreneur, things did not turn out as planned and it was sold to Young Life in 1953. Each week during the summer, Malibu Camp is host to over 300 high school students and their Young Life leaders. Through the narrows and we headed slowly up Inlet. Because it is so protected by the high mountains (some as high as 2100 metres or 7,000 feet), Princess Louisa Inlet is flat calm and placid. At the end is Princess Louisa Provincial Marine Park with Chatterbox Falls just off to the left. There is a mooring buoy, stern pins, a boat dock and a dinghy dock for boaters. Don took us into the dock and brought out coffee and muffins for a quick snack then we had an hour to explore the falls and surrounding area. 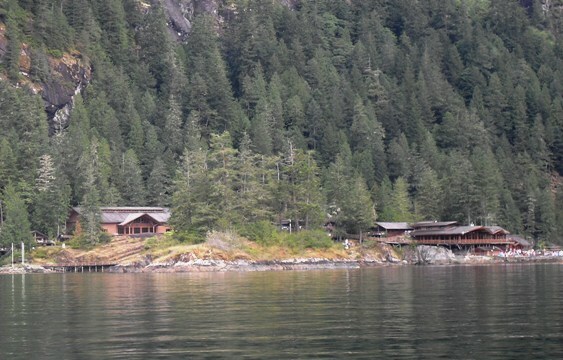 There are washrooms, a ranger cabin and campsites. I can't imagine anything lovelier than coming up and camping here for a night during the summer. Apparently, the Westcoast Wilderness Lodge has a package where they will bring you up to Princess Louisa Inlet Marine Park with a guide and kayaks. You get to kayak once you are there and your guide will set up camp and do all the cooking. Sounds like heaven to me! Princess Louisa Inlet with Chatterbox Falls in the distance. Once we got back to the Egmont area, we had an added bonus of a trip through the Skookumchuck Rapids. The tide was at peak and Don took us through the main rapids, past the North viewpoint in the Skookumchuck Narrows Park. Then back through another narrow passage between two islands and then back through one more time. It was quite exciting to actually experience the rapids in a boat, but beware as the rapids are very dangerous when the tide is running and you would not want to try this yourself. 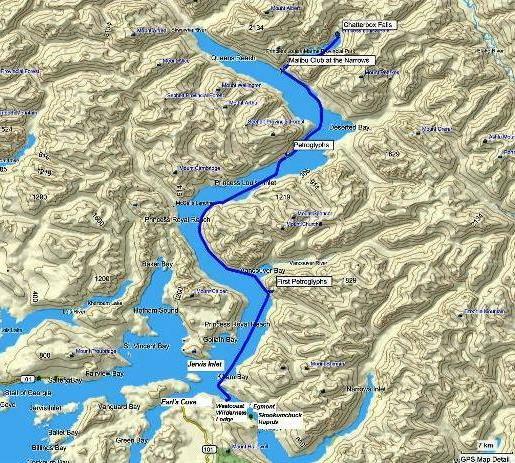 Just one last thing I want to say is that I know someone who has kayaked to Princess Louisa Inlet and she said that the trip is very intense with most days being 8 hour paddle days. There are not a lot of places along the way to overnight as the mountains mostly rise straight up out of the ocean. The other piece of information she passed along is that because much of the land through Jervis Inlet belongs to the Sechelt Nation, you should contact them to get permission to travel through this area. Here's what the route looks like in Google Earth. The image is interactive. It's a Google Earth gadget that embeds the image of the route. You can zoom in and out of it with the zoom bar on the right. You can also use the slider bar to move through the route. It's pretty cool. Click on the map above to open a higher resolution pdf version. 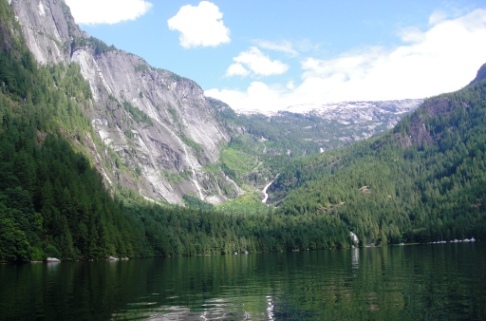 If you like my Page about Princess Louisa Inlet, please let Google know by clicking the +1 button. 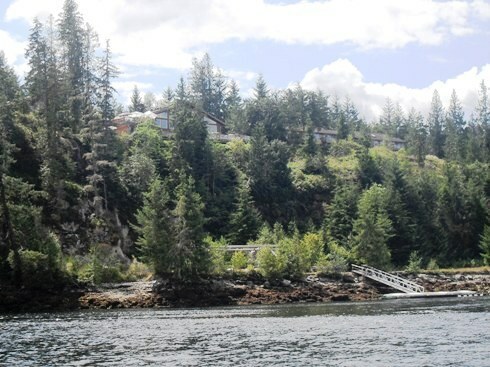 Click here to return from Princess Louisa Inlet to the Sunshine Coast Trails Home page.